If you are thinking about your next family trip, consider visiting Morocco. 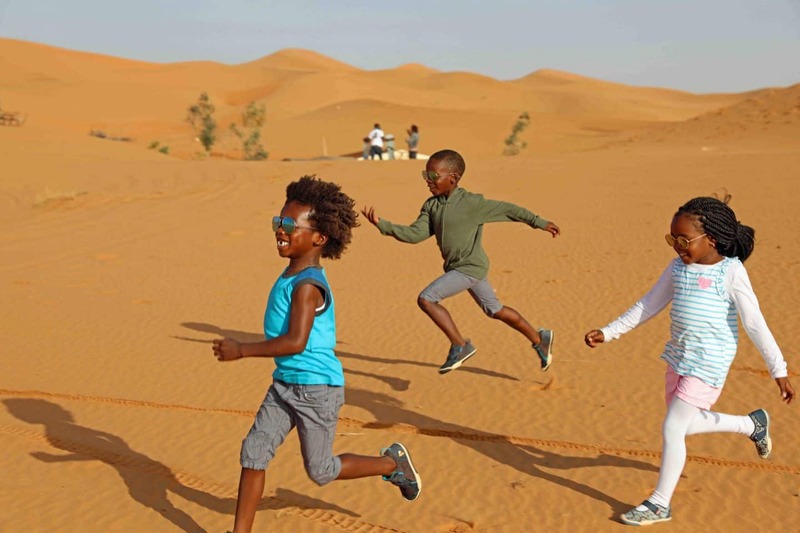 Don’t forget to make sure that you include camping in the Sahara Desert with kids as a must do. This is an experience that you and your kids will cherish forever. I have read horror stories of people who hated camping in the Sahara Desert with kids because they had a bad experience. 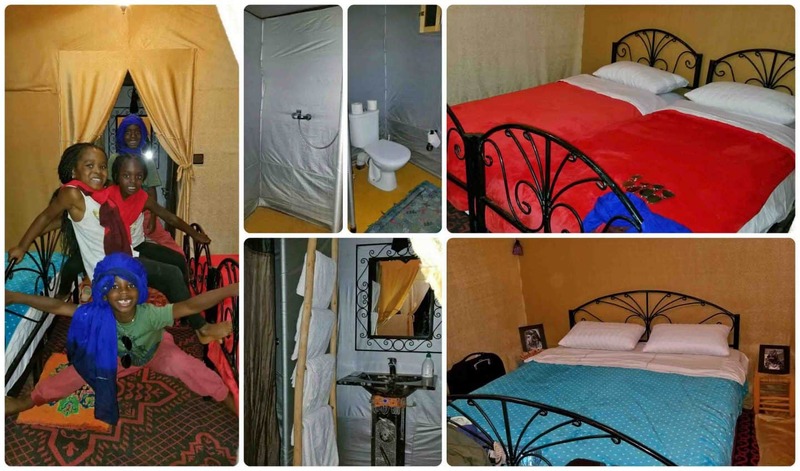 I highly suggest you read this post thoroughly before booking with any tour company or before going camping in the Sahara Desert. 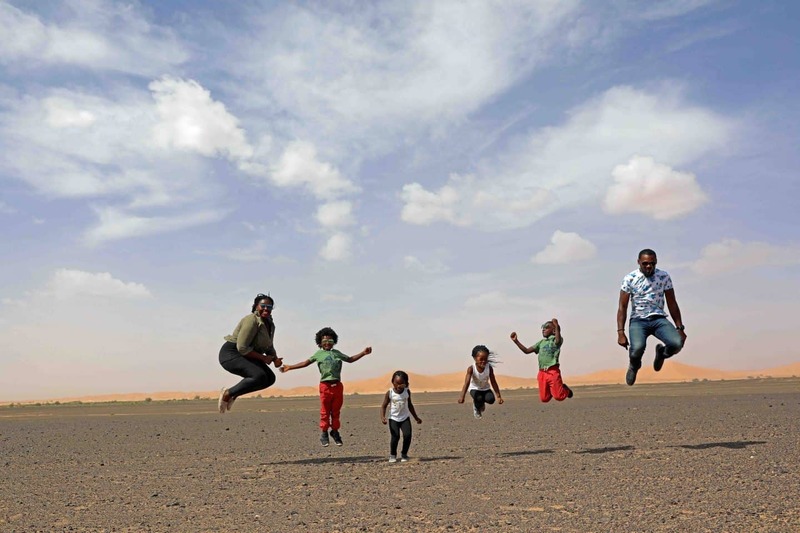 Should You Go Camping In The Sahara Desert With Kids? The name ‘Sahara Desert’ is Arabic for ‘The Great Desert’ which can be found in sections of Algeria, Chad, Libya, Mali, Tunisia, Sudan, Niger, Mauritania, Egypt, Western Sahara and Morocco. The Sahara Desert in total amounts to 31% of Africa and is the largest hot desert, and the third largest desert in the world. The other two deserts by definition of receiving less than 10 inches of precipitation per year are Antarctica and the Arctic. In Morocco the Sahara Desert is located in Merzouga, and it is also referred to as the Ergg Chebi Dunes. I have always been mesmerized by the Sahara Desert and dreamed of the day I would one day get to visit. When I was planning our trip to Europe, I was excited when I saw cheap flights from Italy to Morocco on Skyscanner and booked it immediately. 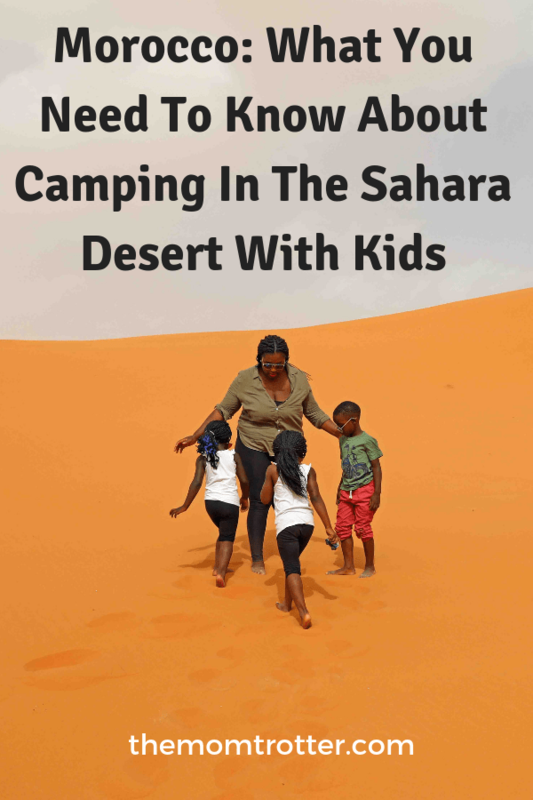 The thought of going to Morocco and seeing the Sahara Dessert was exciting, however I was even more excited about camping in the Sahara Desert with kids. 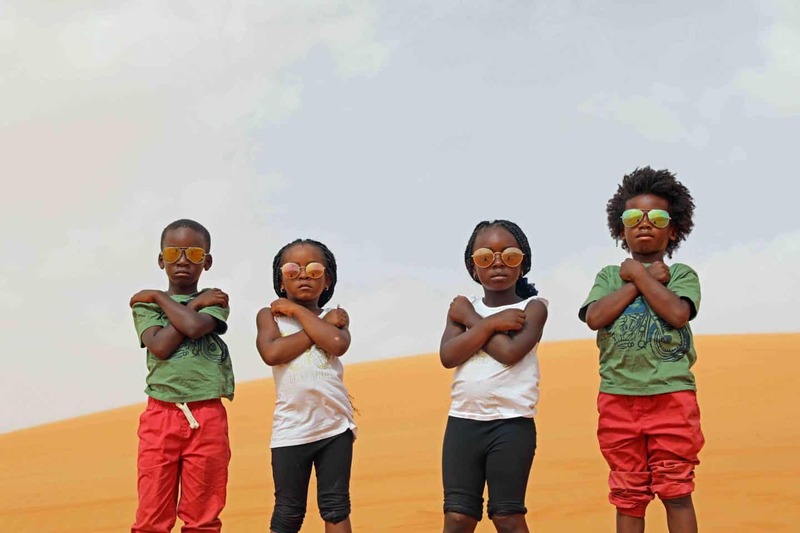 My goal in this blog post is to answer all questions related to camping in the Sahara Desert with kids in this blog post so that if you are considering experiencing this in Morocco it’ll be easy for you. 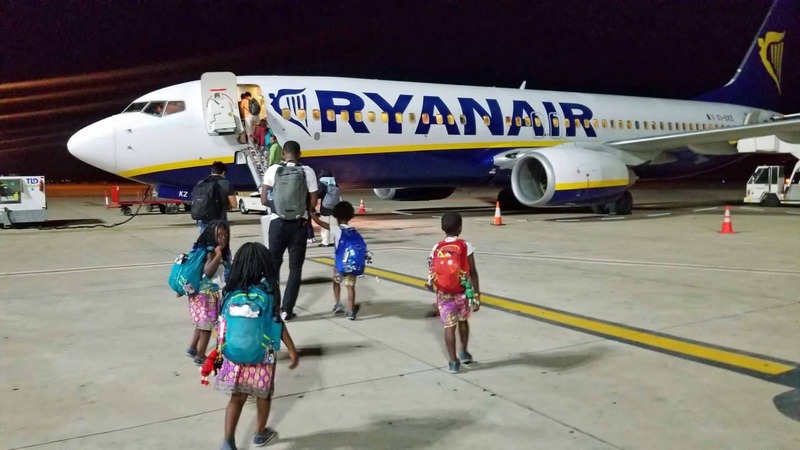 We flew to Fez, Morocco from Pisa, Italy on Ryan Air. I booked our tickets on Skyscanner and it costs us $27.21 per person – make sure you download the Free Skyscanner App for the best deals on airfare. 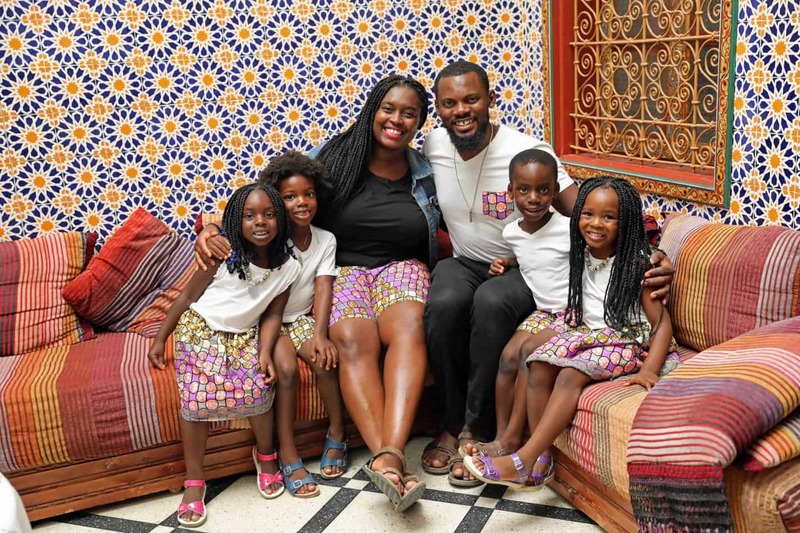 You can read more on how we spent our time in Fez here – Is It Safe To Visit Fez Morocco With Kids? Our trip started off in Copenhagen & Billund, Denmark -> London, UK -> Pisa & Florence & Volterra, Italy -> Fez & Sahara Desert, Morocco and ended off in Barcelona, Spain before flying back home to California. I love planning our trips when we travel, however, I knew that I would not be able to fully plan our trip to Morocco without the help of someone who lives there. Morocco isn’t like Europe or the USA where you can easily rent a car and drive to where you need to or take the bus/train to get around. I wanted to make sure that our days were well planned and our method of transportation secured; especially as we didn’t have much time in Morocco. My favorite website for reading reviews is TripAdvisor, so I went there immediately and searched tour companies in Morocco. I made sure to scroll through and read the reviews for each one of them. This was very time consuming, but I wanted to make sure I was choosing the best tour company. There are many tour companies in Morocco, and I was able to narrow it down to about twenty. I then emailed every single one of the tour companies this generic email below. My family and I plan to visit Fez, Morocco from 4-10 October 2018 and I am looking for a tour company to handle the logistics. Our family of 6 consists of 2 adults and 4 kids aged 5,5,4 and 3. We want to spend 2 nights in Fez – we would love to stay in a Riad somewhere in the Medina and do a tour of the Medina. 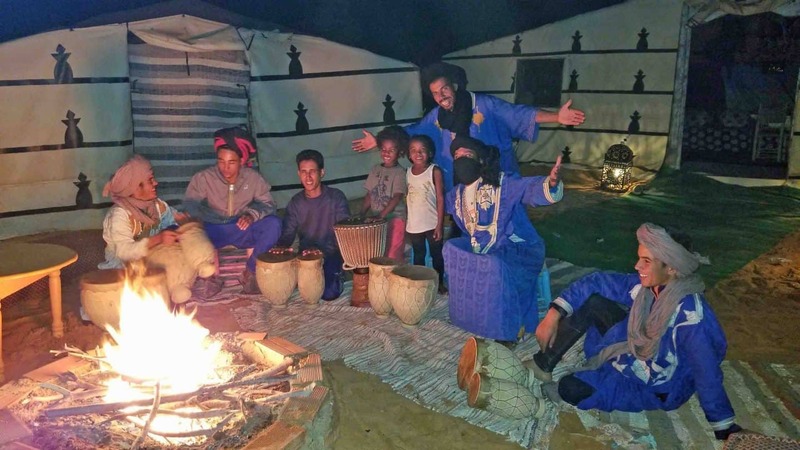 We also want to spend 2 nights camping in the Sahara Desert with kids including learning about Berber culture and riding camels. Can you please share a detailed itinerary with me as well as price list so that we can know what to expect? In order to avoid too much back and forth, I told them the dates I planned to visit, how many members of my family including adults and kids ages, I told them what I wanted to do and where I wanted to go. This gives the tour company an idea of what you want and makes the process much faster. Within 1-2 days I had heard back from at least 10 of the tour companies I emailed with sample itineraries, very similar and prices. Ultimately, I made my final choice based on price because all the tour companies I emailed had at least 5 stars. We booked a private 3 day / 2 night tour with Iddir at Marvelous Morocco Tours. If you plan to use this same our company we used, make sure to mention my name to him. Or email me karen@themomtrotter.com and I can answer any questions you have. Most tour companies in Morocco offer tours to Merzouga, were the Sahara Desert is located. You can take a tour from Fez, Marakech, Casablanca etc – just note that the drive time will vary depending on your starting point. The drive time from Fes to Merzouga is 7 hours, however it took us about 10 hours with all the food and bathrooms stops. There are many variations of tours offered, group tours and private tours. 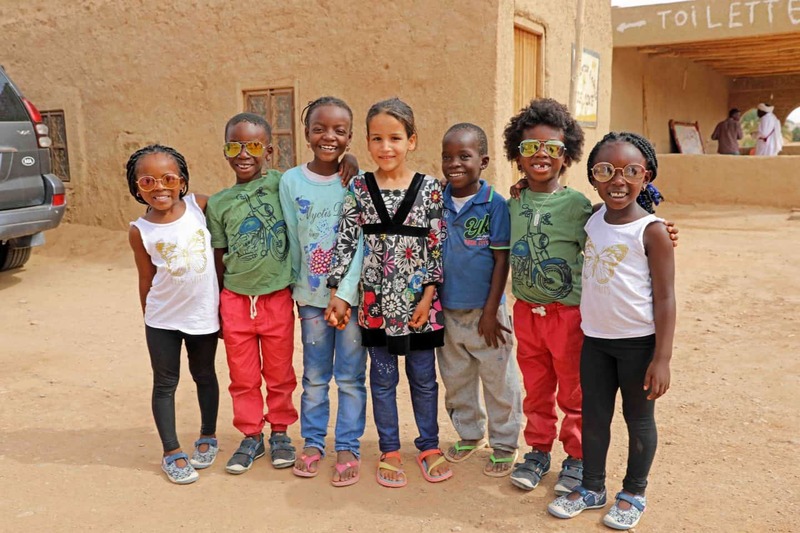 You can also start in one city and end up in another such as Fes to Merzouga to Marrakech. We had to do a round trip tour from Fes back to Fes because our departure flight was out of Fes. Pro Tip: Fly into one airport and out of another to maximize your time in Morocco. The itinerary below is exactly what was provided by Iddir at Marvelous Morocco Tours. I wanted to change the wording, but I decided to keep it the same so that you know exactly what the tour was compromised off. This will give you a general idea and help you when booking your own tour. Do note that you can always remove or add things to suit your needs. We flew into Fez and spent one night at Riad Hala which is located in the Fez Medina before heading out on our tour. – Pick up from your hotel in Fes very earlier and departure for the south of Morocco. We were picked up by our driver in a spacious, clean 7-seater car. 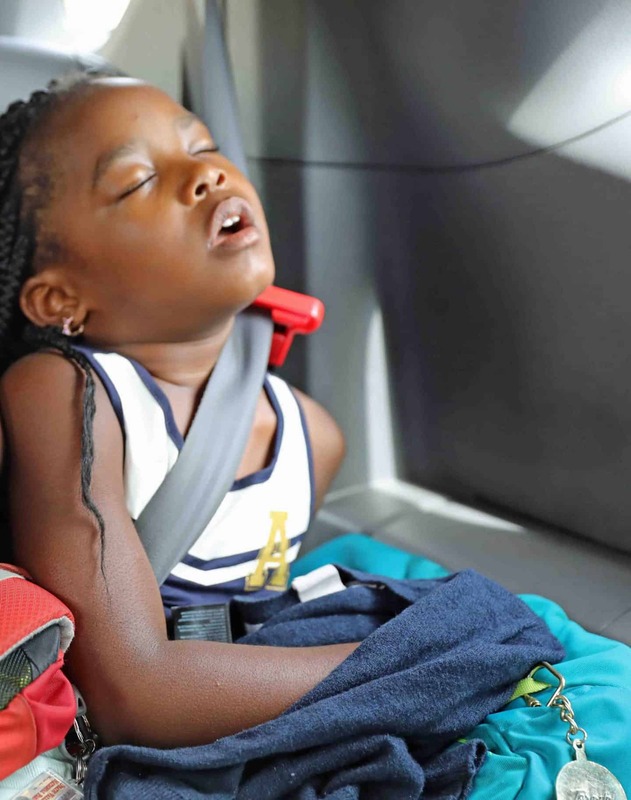 We traveled with the kids Mifold Portable Car Seat to keep them safe for the long ride. 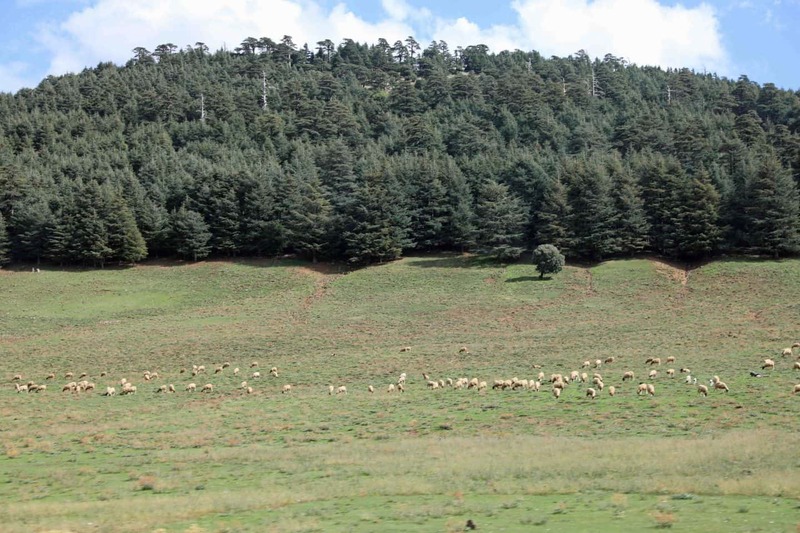 – You will have a stop in Ifrane, known as the Switzerland of Morocco to enjoy its beauty and to have memorable photos. After that you will head toward Azrou to see the monkeys in the cedar forest. We started our tour late and unfortunately were not able to see the monkeys in Azrou. Pro Tip: Leave for your tour on time so that you can make as many stops as you need to, and see all the amazing things on the way! – Continue to Midelt for a lunch meal in a restaurant. In the afternoon, we will cross the pass of Tizi N Talghamt to reach Errachidia while admiring the views of Ziz gorges. We stopped for lunch and the kids tried traditional Moroccan food served in clay pot called tagine. The kids opted to try the camel tagine! They enjoyed it, however I did not. I just couldn’t get myself to eat camel meat. – Later on, you will have a stop for a panoramic view of Ziz valley. The drive from Fes to Merzouga has beautiful scenery. I didn’t want to close my eyes and miss anything. 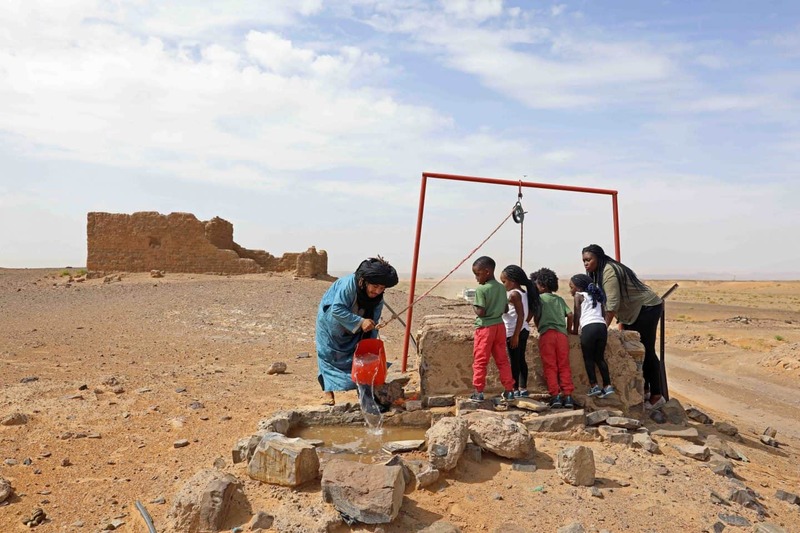 – The drive continues to Erg Chebbi Dunes passing by Aoufous and Erfoud (the last is famous with fossils and dates) where you may want to visit a local fossil craft workshop. Because it was already dark by the time we got to Erfoud, and the kids were napping, we did not stop to see the fossils. 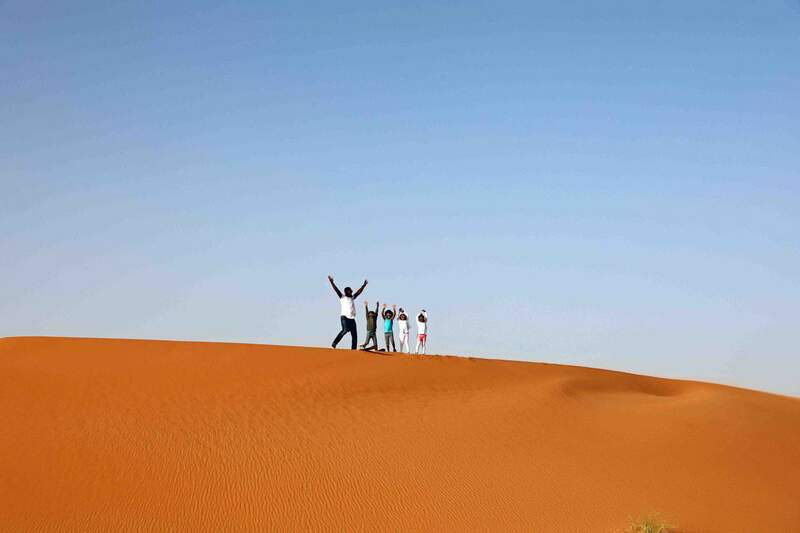 – After that you will continue to the captivating dunes of Erg Chebbi, these dunes are called also Merzouga Dunes. Dinner and spend the night in a room in a hotel next to the dunes. We spent the night at a decent hotel in Merzouga. The hotel had a pool but we didn’t get a chance to swim there. If we had more time, we would have because it was quite hot by the time we got to Merzouga and a dip in the pool would have been amazing. – After breakfast in the hotel, you will have a tour of the dunes on 4×4 allowing you to visit the black volcanic rocks of marble fossils, visit a nomad family living in tent, visit to Khamlia village famous with black people and entertainment with their spiritual music of Gnawa, and visit the lake Dayte Sarji that forms in springtime which attract pink flamingos and wildlife. 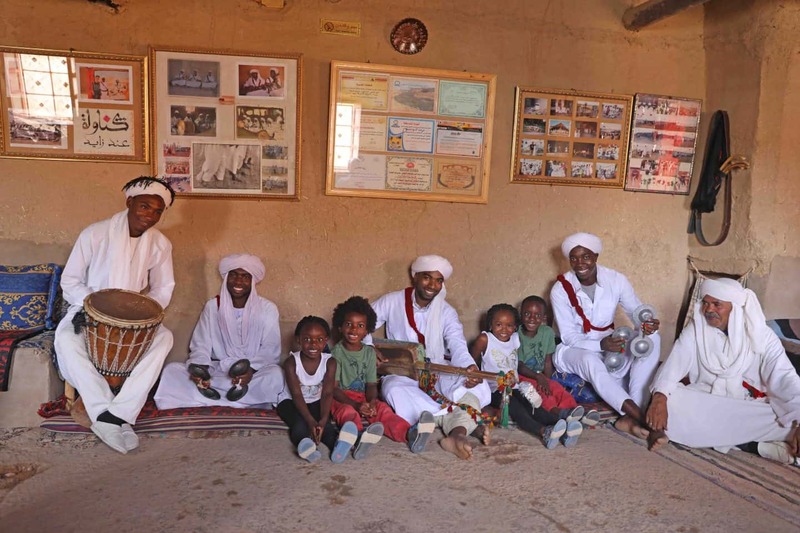 Visiting Khamlia was so nice, the kids interacted with and took photos with the locals. We learned about the music and history. It was beautiful. I love to see how these kids bond and make friends with new kids all over the world even when they don’t speak the same language. – You will have a break for lunch in Merzouga or Hassi Labied. After lunch you will see the canal irrigation system and have a walk on the oasis located on the foot of the dunes. Iddir invited us for lunch at his sister’s home where we enjoyed delicious ‘Berber Pizza’. When the kids heard pizza, they were excited, only to find out that it was completely different from American pizza. However, they tried it and liked it. One of the reasons I love travel – exposing my kids to new foods. 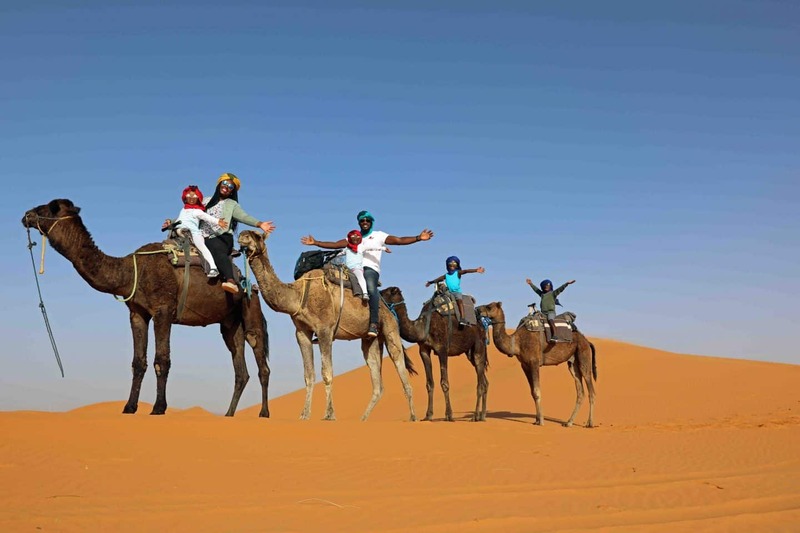 – Continue to your hotel for relax and get ready for a camel trek for an hour and half to enjoy the sunset. 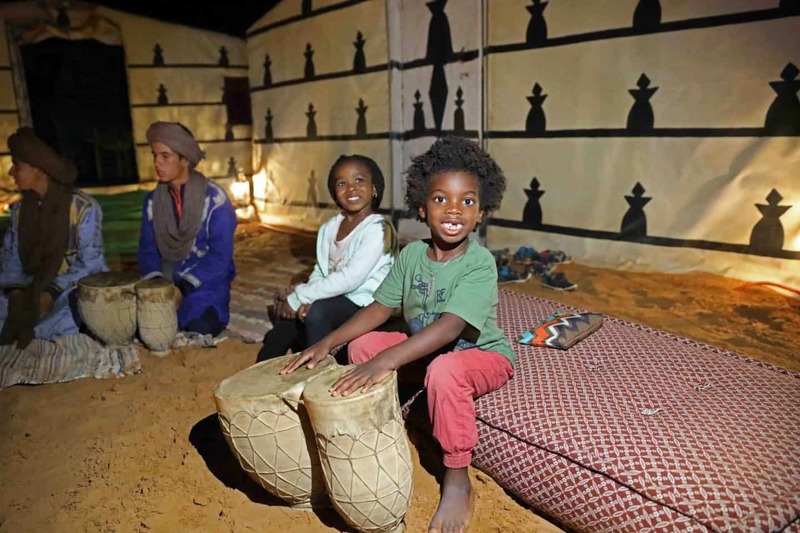 While on the back of your dromedary, you will continue to the camp for an overnight in traditional nomad tent. After lunch, we did not go back to our hotel because we checked out in the morning after breakfast and left our bags in the car. We went straight to the where the camels were waiting and got ready for our one and half our ride to our camp site in the middle of the Sahara Desert. The kids were sooooo excited about riding a camel, the boys are both 5yrs old and rode the camel by themselves, and the girls 4 & 3yrs old and rode with my husband and I. It was awesome when I initially got on, but after about 30 minutes, my crotch area hurt really bad – haha. I had to get myself together and deal with the pain because the kids loved it and they were having such a great time riding. Next time I’ll pass on the camel ride and take the 4×4 all the way to the camp site instead and save myself the pain – 😊. – Dinner and spend the night in a tent in the middle of the dunes. By the time we got to our campsite, our luggage had already been delivered to our tent. Our tent was simply amazing! It was so much more than I expected. It had a warm running water, lights and flushing toilets. When I thought about camping in the desert, this is not what came to mind. I thought I booked a regular tent but this turned out to be a luxury tent. 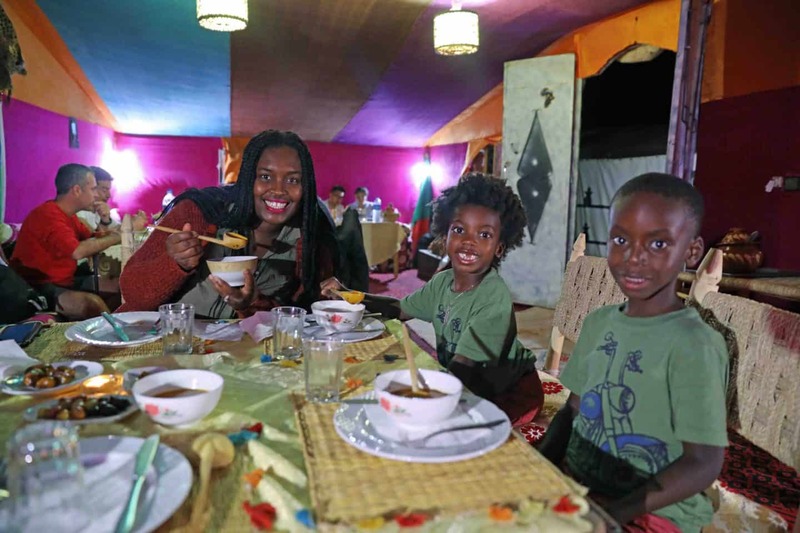 The dinner we had at the Berber camp was the best meal I had in Morocco. 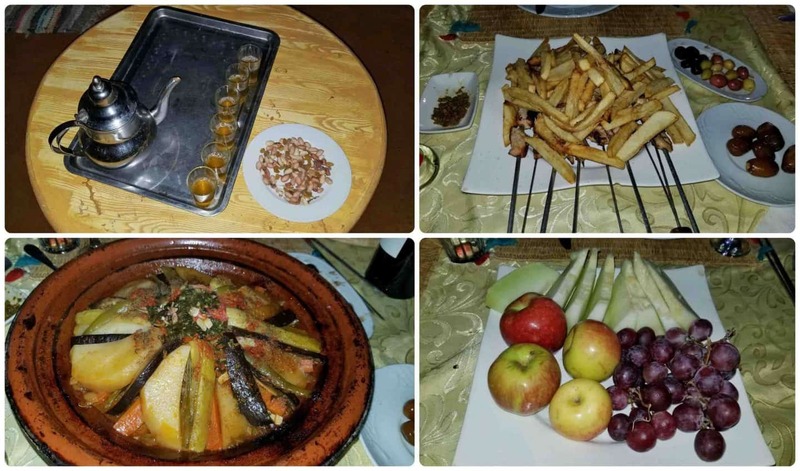 We had a 3-course dinner meal, bread, berber soup, grilled chicken with fries and finally beef tagine and then topped it off with a basket of fresh fruits!! The kids and I were stuffed by the end of our meal. I wish we had more than one-night camping as it just wasn’t enough time. We were told that the men cooked all the food – so impressive! 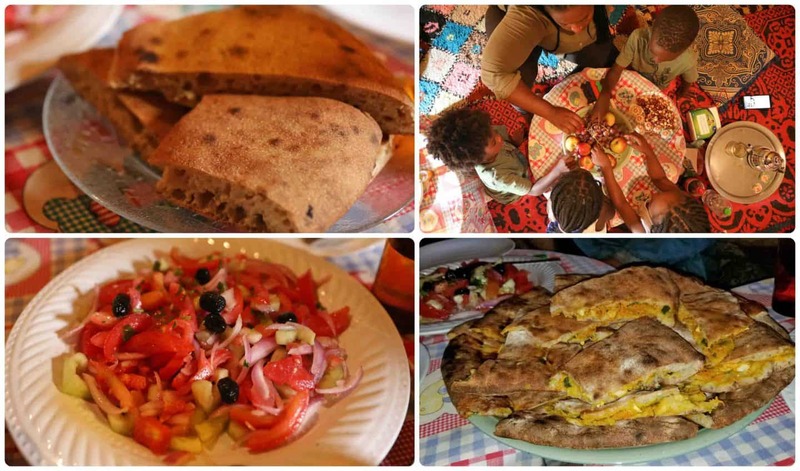 The women stay home with the kids, while the men lead the tours to the camp sites, cooking and more. After dinner it was drum circle time. The men played drums and sang while we danced around the fire and drank mint tea. There were a few other people at our camp whom we chatted away through the night and danced around with, a couple from China and a few guys from Europe. The kids also took their shoes off ad played with the sand. It was truly an amazing night under the stars. – Wake up early morning to enjoy the sunrise on the top of the dune in the Sahara Desert then have your breakfast. After these beautiful moments, you will ride your camel back to the starting point. After which we will transport you back to and drop you off in Fes with the address your provided earlier. We woke up late the next morning and missed the sunrise – we were so tired! We took a shower and then enjoyed a yummy Berber breakfast. After breakfast, we went riding down the sand dunes. The kids had a blast playing in the sand and tumbling over. After breakfast we rode the camels back to where we were picked up and our driver was waiting. He then took us back to Riad Hala in Fez. We stopped a few times for bathroom breaks and to eat as the kids needed. The kids slept most of the ride back because they were exhausted from all the playing and activities. Even though the Sahara Desert is well known to be extremely hot, it does get cold also – Yes! 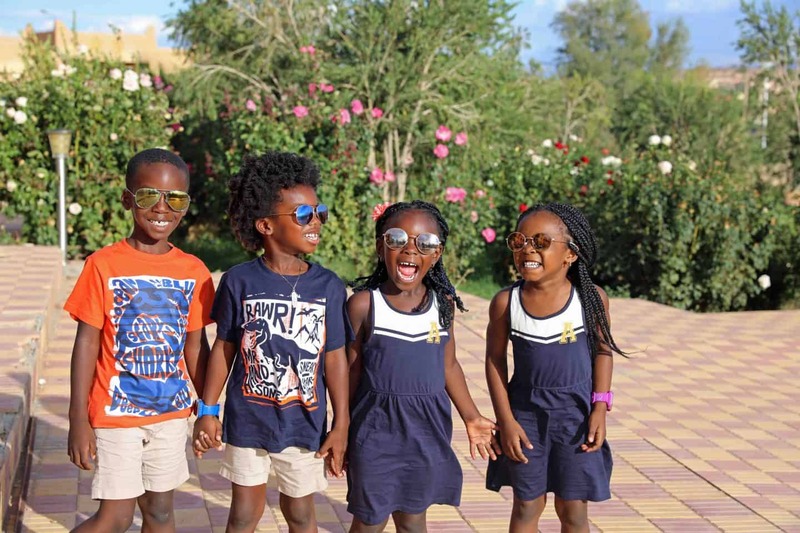 We were in Morocco with kids in October, which is high season because of how beautiful the weather is, not too hot or not too cold – just perfect! May to October is the best time to travel to the Sahara Desert because of milder daytime temperatures. The Saharan Winter is between December and January and it can get very cold at night. So keep this in mind when going camping in the Sahara Desert with kids. 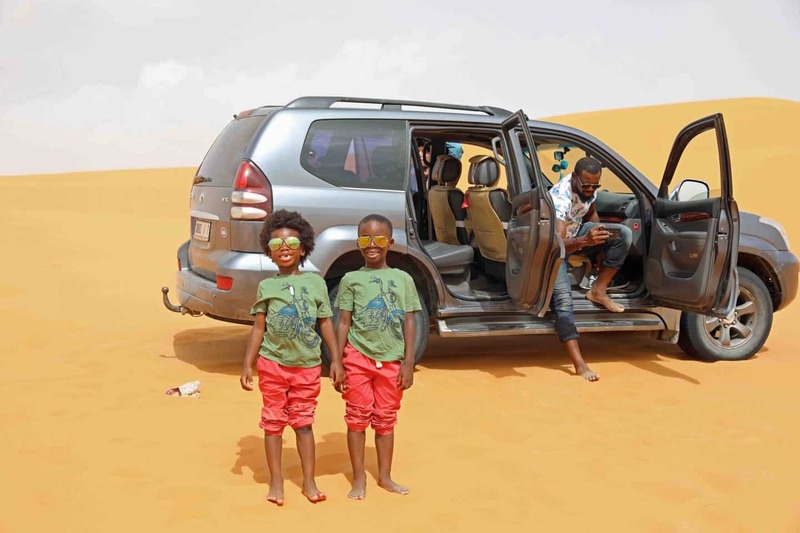 These are the things we packed prior to camping in the Sahara Desert with kids. We did not need anything else other than what I have listed below. Long pants, especially if you plan to ride the camel. The fur can be ticklish and so pants are high suggested. Sweater or something warm to wear when you get cold. Although this is the desert, it does get cold at night and early in the morning. Closed toed shoes are recommended. Don’t pack your favorite pair as they will get very sandy. You’ll need a scarf to protect you from the wind, plus it looks super cool! You can always get one when you get to Merzouga. Iddir had a scarf for each one of us and just the perfect colors for the girls and boys. It will get hot, make sure to take a bottle of water for the camel ride. There is a place where you can put your water bottle so you don’t have to hold it. Charge your phone or camera battery so you can take as many photos as you need. Our camp tent had electricity so we used that opportunity to recharge our electronics – however not all camp sites offer that. A power pack will come in very handy at this time. I always pack wipes when we travel, I was glad to be able to clean the kid’s hands as they were touching all sorts of things. Snacks/Drinks – something to snack on and drink in between meals. The drive to the Sahara Desert is long, keep this in mind and think about how your children will do on a 7-10 hour drive. My kids slept, read, enjoyed the scenery, chatted with each other, and before we knew it, we were there. We made it through the entire drive without any electronics and the kids were just fine. I highly recommend booking a private tour if you can afford it. Being able to stop when we wanted during the drive was gold. The reception in the desert is sketchy, so don’t expect to have full internet access. 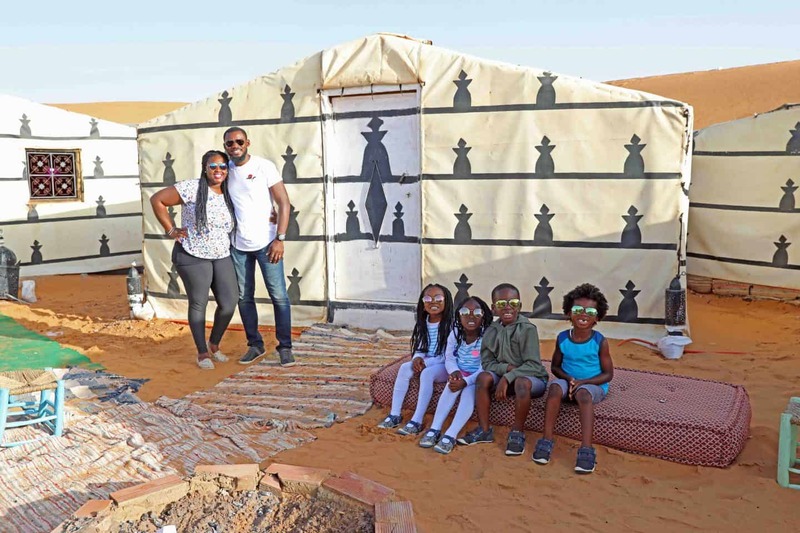 I was very okay with this because it gave us time to disconnect and just enjoy being in the Sahara Desert with kids. 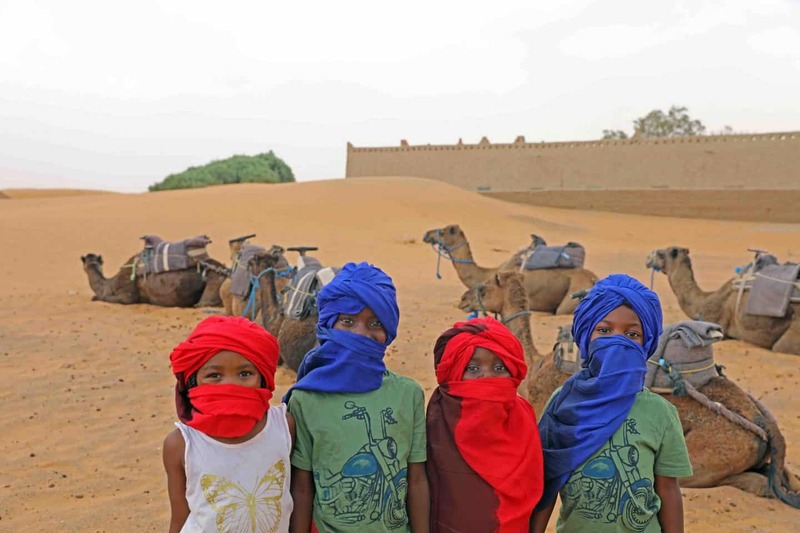 Make sure to get the full schedule of events when you book your tour to the Sahara Desert with kids. It is important to know before-hand what to expect. 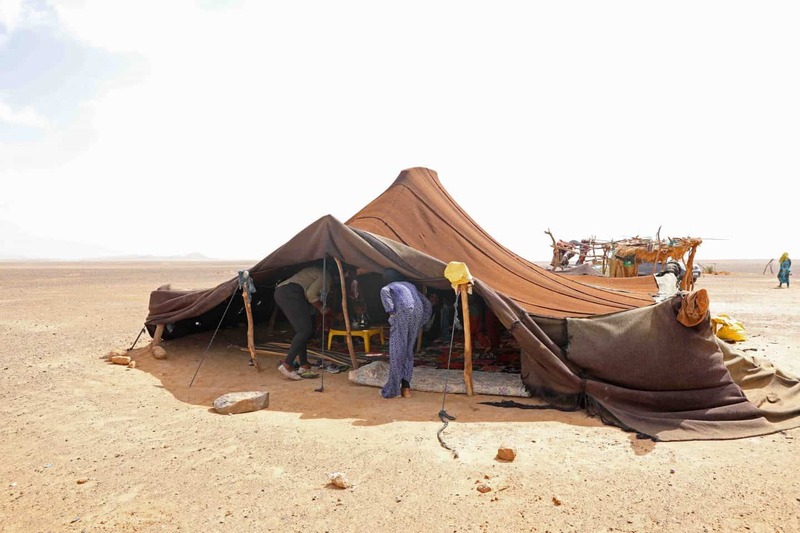 Find out beforehand where you be will staying, the hotels and the Berber tent camp. In my case I was surprised and excited by how amazing our camo site was, however that isn’t always the case. I have also seen some very basic camp sites without showers etc. Make sure you ask the tour company to explain exactly what type of tent you will be sleeping in. If you don’t think you’ll enjoy the food, make sure to pack some food. Pack snacks also just in case you get hungry in between meals. We stopped at the grocery store before we got the Merzouga and stocked up on snacks, water and drinks. My husband bought a bottle of wine that we enjoyed with our dinner – best idea ever! If you or your kids don’t fancy riding camels, skip it and ride he 4×4 to your camp site instead. 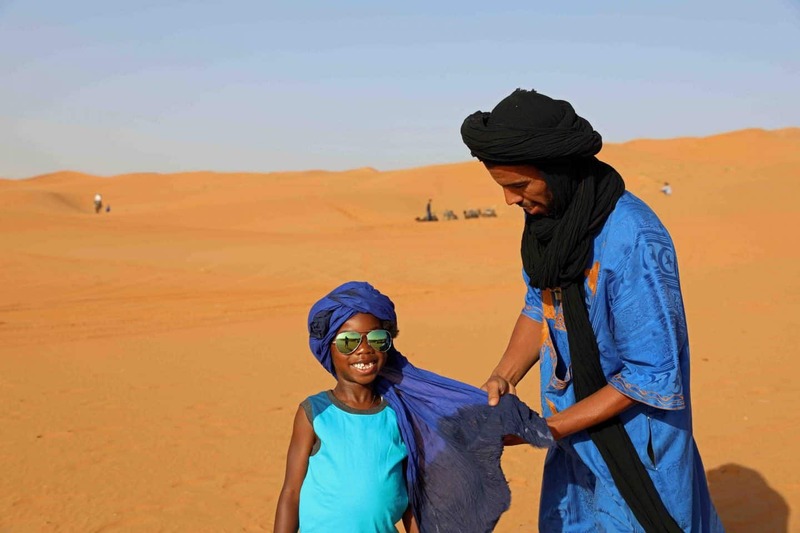 Prior to camping in the Sahara Desert with kids, make sure you know what is included and what isn’t included in the price of the tour that you booked so that you can plan for additional expenses along the way. Overnight in Merzouga with dinner & breakfast. Camel Trekking & overnight in private Berber Camp tent with private bathroom including dinner & breakfast. 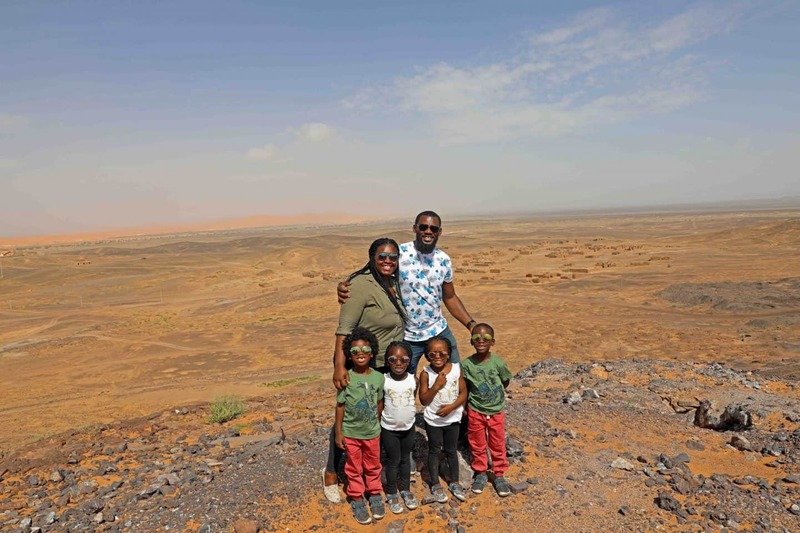 Our time spent Camping in the Sahara Desert with kids is the most amazing travel experience we have ever had as a family. 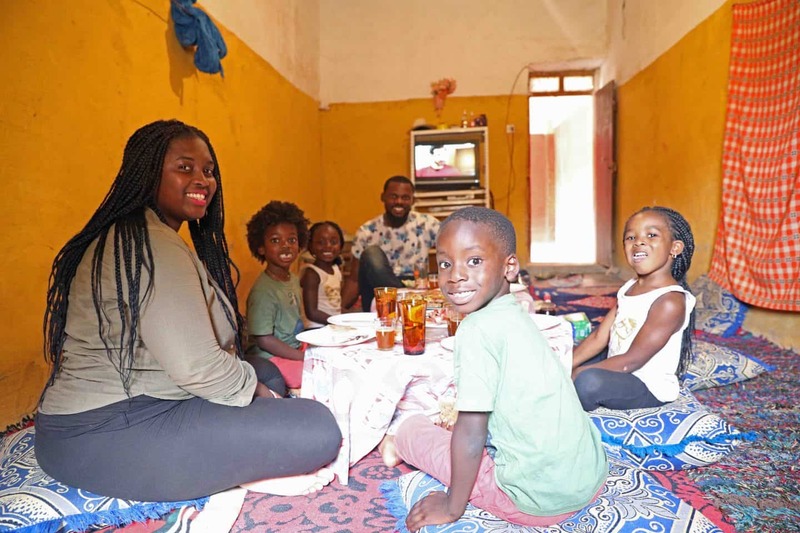 The kids were mesmerized by the sand, they loved the culture, the people were so nice and friendly, and the food was amazing; everything about it was perfect. If you are considering camping in the Sahara Desert with kids, don’t think anymore, just do it. If I had to do it again, which I absolutely will, I recommend spending more time in the desert. 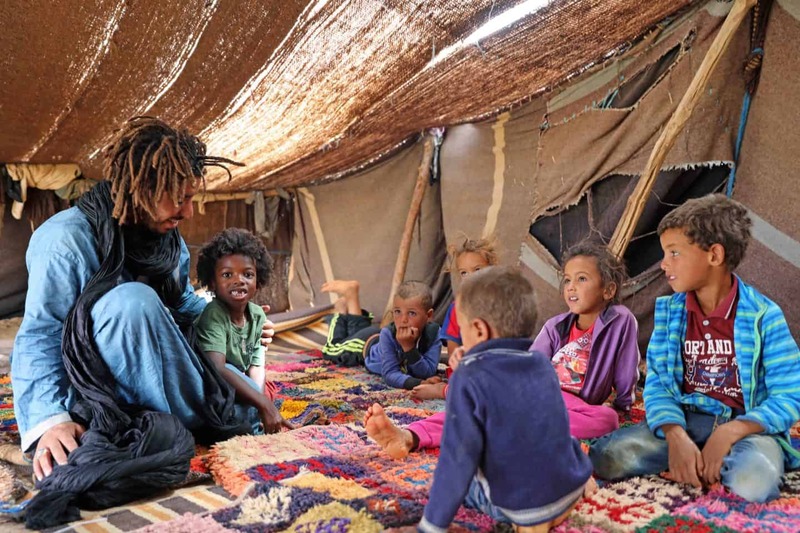 Instead of one night at the Berber camp, plan to spend 2-4 nights. The desert allows you time to be in peace and quiet of nothing but sand. Time to reflect and just be one with yourself. The sand in the desert is so soft and just perfect to sit with your toes dipped in. 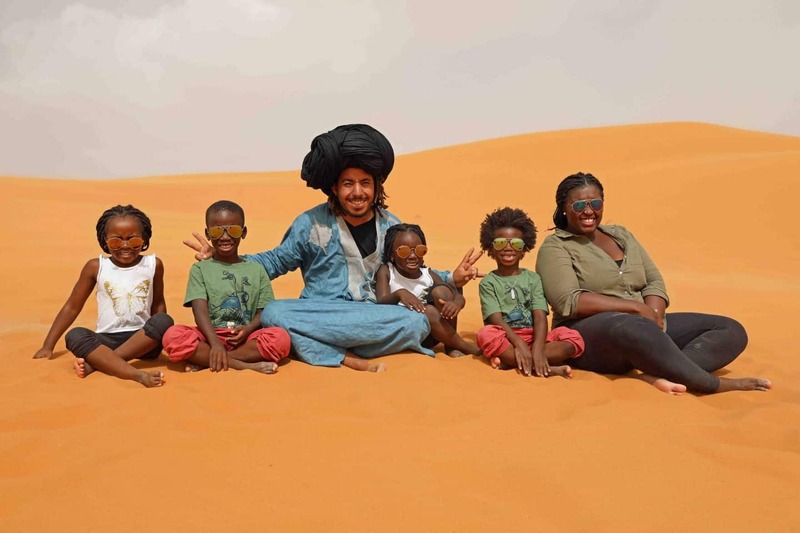 I absolutely believe that every family should go camping in the Sahara Desert with kids at least once. If there are any questions that I did not answer on this blog post, don’t hesitate to comment below and ask, or send me an email karen@themomtrotter.com.